When Alton Mason Jr. and Dilone are together, you know it’s going to be a party. For one, they’ve both got killer dance moves—pick a genre, and they’ll own it. For another, they’re both free spirits, confident in their own skin, and happy to their core. The energy they radiate is totally infectious. The pair met at a rooftop dance party in New York City not too long ago and became fast friends. 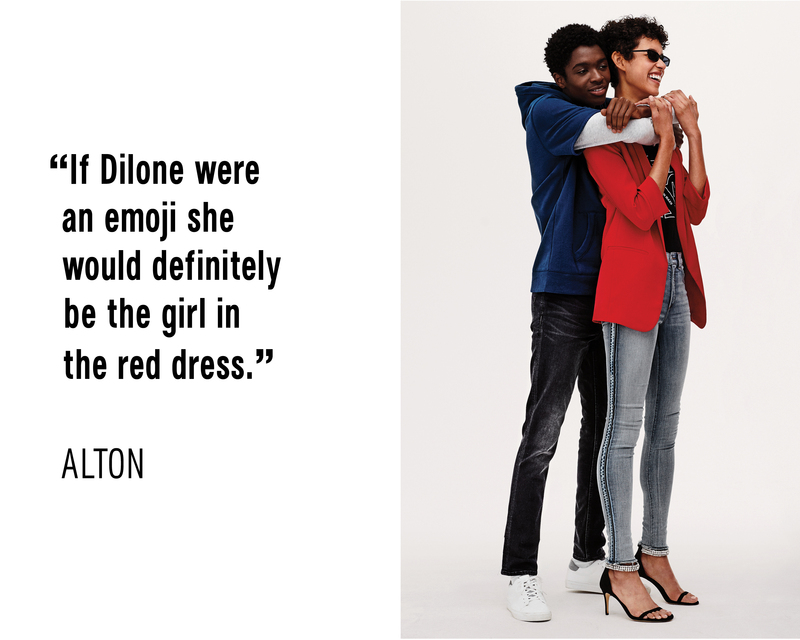 Both caught their big breaks as models during the Fall 2016 runway season—Alton was cast via social media by the one of the reigning kings of streetwear, while Dilone made a splash at 40 (!) shows that season. Now the 20-somethings travel the world in the name of fashion, occasionally reuniting at parties or events to swap stories and shred on the dance floor. When it came time to cast our Fall 2018 denim campaign, we knew we had to bring these two together—and prep the ultimate set playlist for the reunion. In between songs, they dished on friendship, first impressions, and fit. Check it out below.